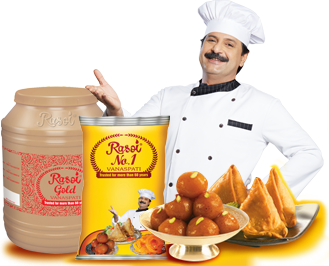 Rasoi Vanaspati Mein Banana Lazeez KhanaThe trusted Vanaspati brand for more than 60 years. Vitamin enriched hydrogenated vegetable oil for a healthy family. Granular and thick in texture, Rasoi Vanaspati is obtained from the hydrogenation of edible oils which are derived from plants. The texture and appearance of Vanaspati is similar to that of natural clarified butter. Vanaspati is one of the most widely used cooking medium in the world. Emami Agrotech entered into the Vanaspati market by acquiring the 60-year-old, Rasoi brand in 2014. Rasoi Vanaspati is a popular brand in Hotel and Restaurant segment in India. It provides great taste and aroma in mughlai dishes and fried items. It is available in all size packs - (No. 1) - 1 L Pouch, 500 ml Pouch, 200 ml Pouch, 15ltr Jar, 15kg Jar, 15 ltr Tin, 15 Kg Tin; (Blue) - 15 Kg Jar, 15 Kg Tin; (Gold) - 15 Kg Jar; (Yellow) - 1 L Pouch, 15 ltr Jar.